The people are the best thing about working at RNW. It is a great thing to get to work with people who are fun, upbeat, and have a great sense of humor. I guess I don't have a favorite RNW moment yet but I am sure there will be many. The outdoors is where I want to be when I am not working. I like to team rope and just get out and ride my horse. Spending time with friends and family is a big part of my life. I also love travelling to warm and sunny places. The water is an amazing part of the Montana landscape for me. I love doing anything recreational on the water. In the summer it is great to go camping and fishing on a lake or a creek. I would say hiking into the Bob Marshall Wilderness is my favorite moment to date. I spent seven days hiking and camping through a small part of the Bob. 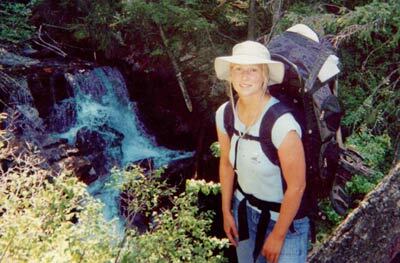 It was incredible to find the will power with in myself to carry a 40 pound pack seventy some miles. Some of the most beautiful scenery I have seen was there too. Being away from civilization for those several days with just the bare necessities you get in touch with yourself and your body. The best moment was when I got home. Seeing myself in the mirror again was like seeing me for real for the first time. I never was more proud to accomplish something that was as physically challenging as that trip was for me. 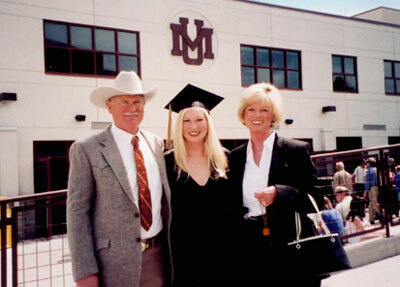 My favorite photo would be of my parents and I standing outside of the auditorium at the University of Montana on the day of my graduation. Seeing my parents smile with overwhelming joy for what I had accomplished was incredible. I can still look at that photo and feel just like I did that day. A defining moment in my life was winning seventh in the world Morgan Horse Championship in Oklahoma City. I have shown and competed in horse shows since I was nine years old. I qualified for the World Championship when I was fifteen. I won seventh in the world for my age group of 14-17 with my horse Fortunes Eclipse. It was so amazing placing in that show for me. I have never had a bond with an animal the way I did with that horse and haven't since. We were one amazing team that day. In twenty years I can see myself working and traveling between my homes in Montana and Arizona. I will also hope to be able to once again show horses and begin to raise and breed Morgans or Quarter horses. 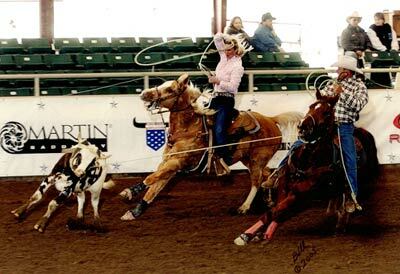 I still would like to be team roping and maybe have my own little group of roping steers. People I look up to are my parents and other family members. I admire them for the simple reason that they have always gone after what they wanted to accomplish in life. I admire people who refuse to take no for an answer and fight for what they want and believe in. If I had an endless amount of money and the connections to make it happen I would want to be able to prevent children from being born with Down Syndrome. One of my favorite authors is Nora Roberts. I like her murder/mystery novels. Her stories take me on wonderful adventurous new places. My favorite series is her Irish Trilogy. I don't really have a favorite artist. I love music so I can't choose just one artist. My favorite song right now is Jake Owen's new song 'If I would have only known'. My favorite celebrity I guess would be Jessica Simpson. I don't think she is a dumb as she makes herself out to be. She markets herself well. I think she has great business sense and seems to keep getting more and more successful. She has several of her own company's and product lines like beauty products, her own line of shoes, hair products and other product endorsements. I think she will be a successful business woman and I admire that she is ambitious. Not to mention she does have a great voice. My favorite actress is the woman who plays Izzy Stevens on Grey's Anatomy. Her character doesn't hold back. She does and says what she wants no matter what. She finds humor in her life even though she has suffered great heartache and loss. I have several favorite shows. Grey's Anatomy, Ugly Betty, Men in Trees and Law and Order are my top four fav's. There is no way I could pick a favorite movie. I like way too many; old and new. My Grandfather would be my top favorite. He played professional baseball for the then Chicago Cubs in the 1930's and 1940's. Another athlete I admire is Tiger Woods. I love to watch him play and I think he is a great person with incredible determination. My favorite food would have to be either Italian or Mexican food. It doesn't matter which one as long as it is spicy. I love any spicy food. Either Crème Brule or Rainbow Sherbet. My pet peeve is people who just aren't real. You are who you are and that is just the way it is. So why hide it?? Life is too short!! This site is dedicated to the promotion of Montana real estate in Western Montana and real estate for sale.